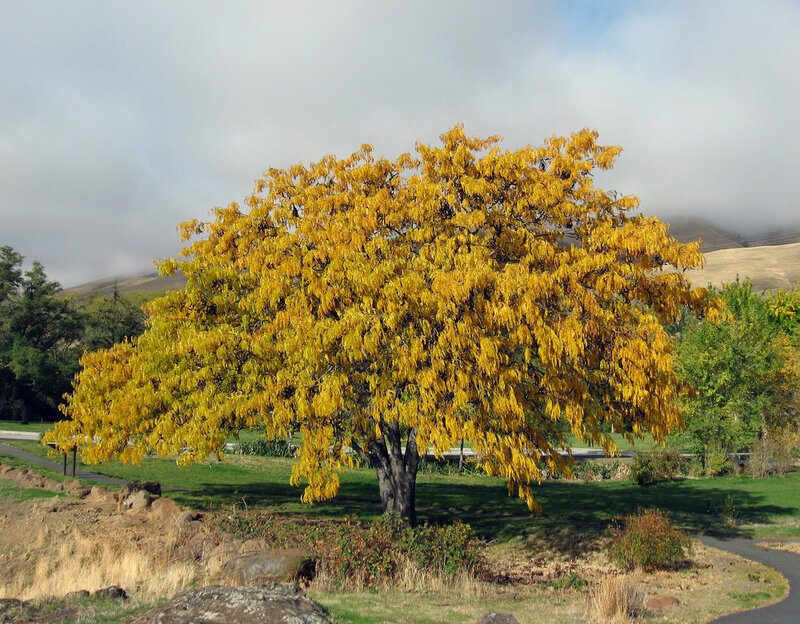 The honey locust tree (Gleditsia triacanthos) is native to central North America, but can be found throughout most of the country. It thrives in New York City with its high tolerance for compacted soil and salt. Because of these tolerances, it is often considered by the city for street tree plantings, and can be found commonly in road medians throughout the boroughs. Honey locusts typically sprouts 1/2-inch long leaflets cloud-like clusters, which turn a bright golden yellow in the autumn. These smaller leaf clusters allow for greater air flow within the tree, which helps the honey locust thrive in windy conditions. Honey locusts commonly have thorns growing on their branches and trunks. These thorns typically grow in dense clusters, and can reach lengths of up to 8 inches. One theory suggests that the trees evolved to produce these thorns to protect their foliage from the Pleistocene-era megafauna that ate their long seed pods. At Arborpolitan, we see honey locusts frequently. They provide an interesting challenge for a tree climber, who has to navigate their branches while avoiding all the many long thorns throughout the tree. A few of us bring the thorns back home, taken from a day's work on a honey locust as a trophy to commemorate a hard-fought job. Though they sometimes present difficulty for us as tree climbers, we still jump on any opportunity to help preserve and shape these beautiful trees.